The lunar landscapes of Cappadocia, a series of barren valleys studded with bizarre geological formations, are like giant sculpture gardens. Add ancient underground cities and rock-hewn churches to this otherworldly natural setting, and you have one of the most visited destinations in Turkey. The scenic and archaeological wonders are simply magical. A vast steppe, Cappadocia lies between mountain ranges to the south and north. Volcanic eruptions occurred there millions of years ago, and the ash was compressed to form a porous rock called tuff. Steady erosion over centuries produced conical pillars that became known as fairy chimneys, as winds whistling through the rocks were said to have sounded like fairy voices. The softness of the volcanic stone enabled the early Christians (and inhabitants before them) to carve out hiding places. Christians used the dwellings and churches to escape persecution during the first centuries of Roman rule. The communities continued to thrive during the more peaceful Byzantine era, then under the Arabs (who allowed Christians to practice their faith) and into the late Middle Ages. Because of the region’s isolation, Cappadocia proved to be the perfect hideout for hermits and monks. The region lies in the heart of Anatolia, the Asian part of Turkey comprising 95 percent of its land area. Cappadocia’s religious treasures, some with well-preserved frescoes, were mostly forgotten until a French explorer rediscovered them in the early 18th century. It’s estimated there are some 500 rock churches and chapels scattered about Cappadocia, most of them unknown to tourists. Everywhere they look, travelers see honeycombs of rock-cut holes, doors and windows etched into cliffs—remnants of past civilizations. 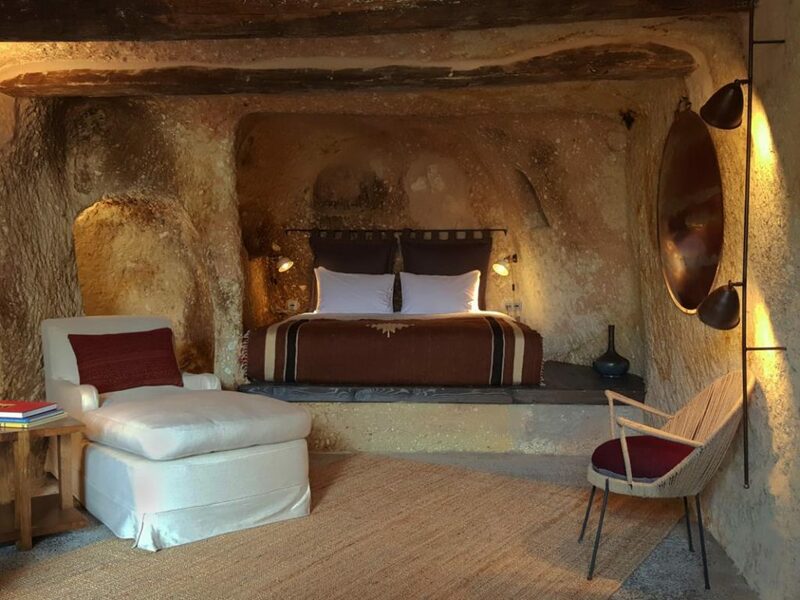 Yet some of these hollowed-out spaces are still inhabited, and many globetrotters don’t consider a Cappadocia trip complete without staying in one of the new cave hotels or dining in a cave restaurant, which have become attractions in themselves. The town of Goreme, with its rock-carved homes and picturesque fairy chimneys, makes a good base for exploring Cappadocia. It has tour companies, shops, restaurants, hotels and the region’s most visited archaeological site—Goreme Open-Air Museum, a UNESCO World Heritage Site. At this roughly circular monastic complex fashioned from tuff, a paved path leads to some 30 Orthodox Christian churches and chapels, plus carved-out spaces that were homes, rectories, monasteries and religious schools. Among points of interest are three 11th century columned churches—Elmali Kilise (Apple Church), Karanlik Kilise (Dark Church) and Carikli Kilise (Sandals Church). They are noted for their Byzantine-style cross plan with central dome and restored paintings of Christ Pantocrator (depicting Jesus holding a book in one hand and giving a blessing with the other) above images of archangels and seraphim. Sandals Church is named for the indentations in the floor, which some believe to be casts from Jesus’ own footprints. On the Dark Church’s walls and domed ceiling, the deep blues of the vibrant frescoes are derived from the mineral azurite. Their brilliance has been retained, thanks to the fact that the church lets in little light (thus its name); the Crucifixion scene is particularly intense. The Dark Church’s extra admission fee (imposed to limit the number of visitors) is worth it. Across from the main museum area, the same ticket grants entrance to Tokali Kilise (Buckle Church), Goreme’s oldest house of worship. Dating from the early 10th century, it impresses with high ceilings and rich blue colors in painstakingly-painted frescoes portraying the life of Christ. 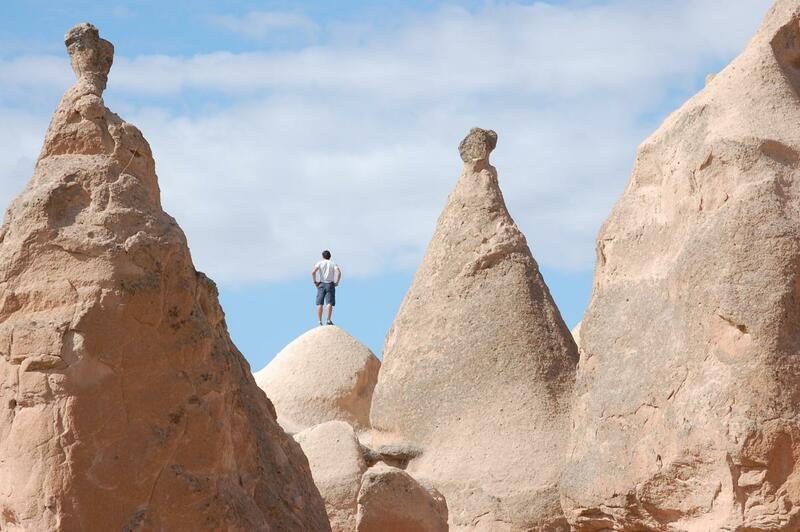 Many points of historical and religious interest are located just a few miles from Goreme. For example, there’s Zelve Open-Air Museum, a fairy-chimney community of cave dwellings that was a center of Christian monastic life between the 9th and 13th centuries. 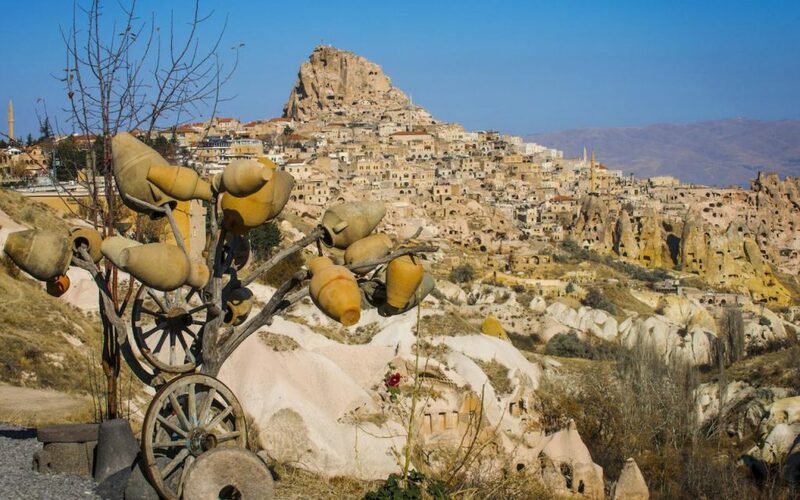 The tourist-friendly village of Uchisar boasts one of Cappadocia’s most prominent natural landmarks, a huge, tunnel-riddled outcrop called Uchisar Castle. Those who tackle its steep steps are rewarded with fine vistas of the rock valleys. 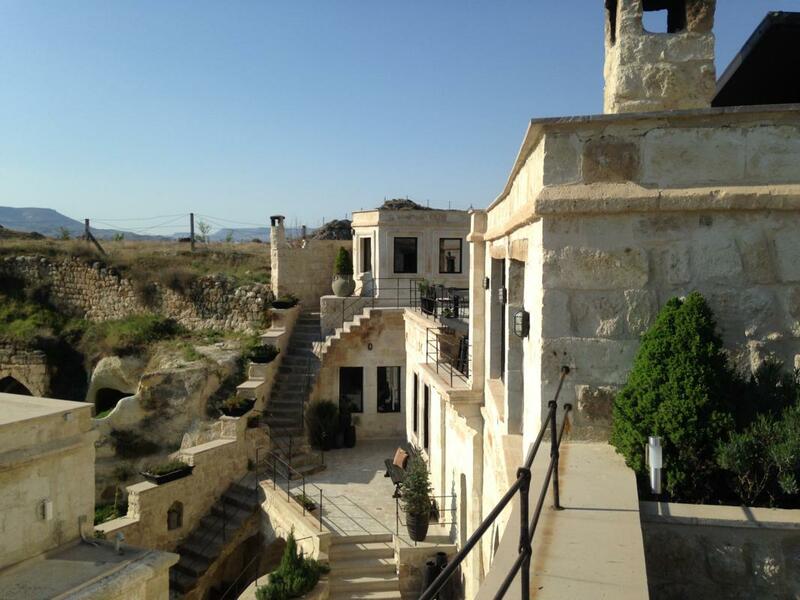 Both Uchisar and nearby Urgup offer a variety of trendy hotels and restaurants. The town of Avanos is famous for its potteries, which use the clay from the banks of the Kizihrmak (Red River). Another magnet for faith tourism groups is the peaceful Ihlara Valley, a verdant river canyon dotted with about 100 rock churches (and some 5,000 houses) in the cliffs above. Compared to the stark landscapes in most of Cappadocia, this pretty, nine-mile stretch along the Melendiz River, an hour or so southwest of Goreme, offers shade trees, other leafy vegetation and the soothing sound of rushing water, plus relief from the tourist throngs at Goreme and other sites in the well-traveled Nevsehir-Avanos-Urgup triangle. It begins at Ihlara village and ends at Selime Monastery and Selime village. An entrance in the canyon’s mid-section, with a stairway of nearly 400 steps leading to the path below, provides access to several fresco-decorated churches within easy walking distance of each other. Reachable by wooden steps, these nooks are in various states of ruin. Unlike scenes depicted in other Cappadocian churches, the ones here are reminiscent of the early churches of Syria and Coptic churches of Egypt. The multi-story Selime Cathedral, just outside the valley’s northern entrance, is the largest rock church in Cappadocia. Built between the 8th and 9th centuries, it’s where the region’s first non-secret mass was said. Two lines of columns divide the cathedral into three naves; dozens of rooms are connected by passages and tunnels. Fresco remnants, dating back to the late 10th century, depict scenes such as the Ascension, Christmas, Adoration of the Magi, Flight to Egypt, Pursuit of Elizabeth, Baptism and Dormition of the Virgin. Just east of the cathedral is the Mother Mary Church, one of the most beautiful rock-carved churches in the area. Of the 40 underground settlements that have been uncovered in Cappadocia, the most extensive is Derinkuyu, which at one time was thought to have housed thousands of people. One group of Christians fleeing Roman persecution arrived in the area from Jerusalem via Antioch (Antakya) and Caesarea (Kayseri) in the second century. Tunnel tours through the labyrinth—definitely not for the claustrophobic—take visitors eight floors down, about 180 feet below the earth. A cruciform church, baptismal pool, wine and oil presses, stables and scores of private living quarters can be seen. The second floor has a seminary, a barrel-vaulted room with small cells believed to have been used for study. Kitchen walls and ceilings bear the signs of soot absorbed by the soft volcanic rock. Smoke was dispersed in the air ducts and ventilation shafts, leaving possible attackers none the wiser. Each floor had an entrance that could be sealed with a circular door in the form of a doughnut-shaped millstone. There’s also plenty to marvel at another underground city, Kaymakli, where five of its levels have been excavated to date. These subterranean sanctuaries have yielded remains dating back to the 4th century but probably were first created by Hittites (1900-1200 B.C.) seeking shelter from invaders. To see Cappadocia from above, consider a hot-air balloon adventure. Many operators offer these early-morning flights over the canyons, cliffs, fairy chimneys, orchards and villages. The memorable experience isn’t cheap—expect to pay about $200 a person—but don’t necessarily go with the lowest price. It’s wise to check out the company’s safety record and pilots’ experience. Other outdoor options include ATV safaris and horseback riding treks. Just being in this tucked-away region in Asia Minor is an adventure in itself. Blessed with stunning works created both by Mother Nature and the hands of man, Cappadocia is a fascinating destination for religious groups looking to explore the early days of their faith. 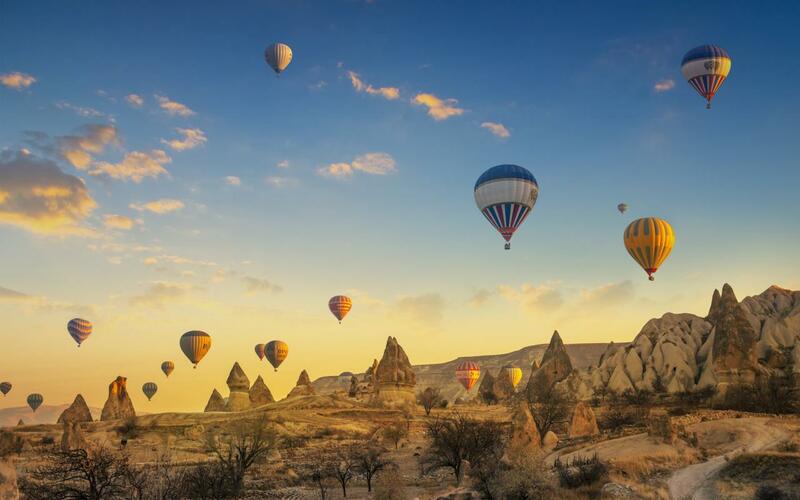 Getting there: Turkish Airlines flights connecting Istanbul with Nevsehir get travelers to the heart of Cappadocia in just an hour-and-a-half. Hotels in Nevsehir, Goreme, Urgup and other towns can arrange shuttle transportation from and to the airport. Turkish Airlines offers nonstop service between Istanbul and nine U.S. cities—New York, Boston, Chicago, Washington, D.C., Atlanta, Miami, Houston, Los Angeles and San Francisco. Cappadocia Museum Pass: Visitors touring Cappadocia can save money over buying individual admissions by investing in this handy pass. Good for 72 hours, it grants admission to major historical attractions, including Goreme Open-Air Museum, Ihlara Valley, and Derinkuyu and Kaymakli underground cities. 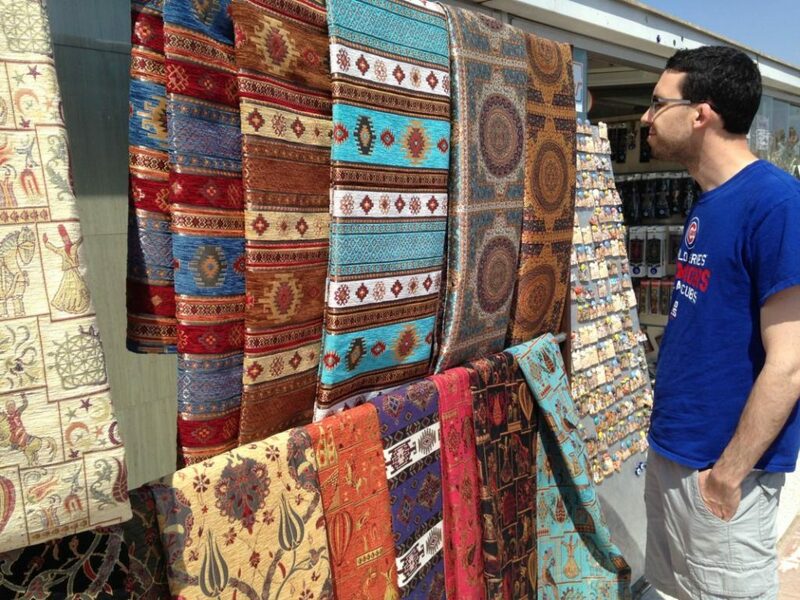 The pass costs 110 Turkish lira (about $21) and can be purchased at the first stop. Safety tips: Reaching the cave churches often requires negotiating rocky paths and climbing steps or even ladders. Though some tourists do this in sandals, better footwear choices would be gym shoes or hiking boots. Also, there are drop-offs with no railings for protection, so it’s advisable to pay attention to your surroundings, especially when you’re framing a picture. 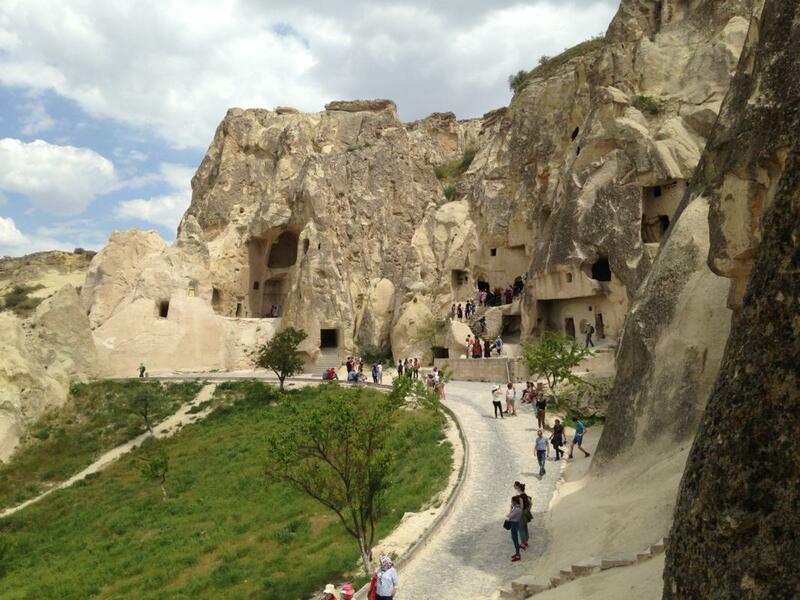 At Goreme, some of the churches can be entered and exited at ground level. 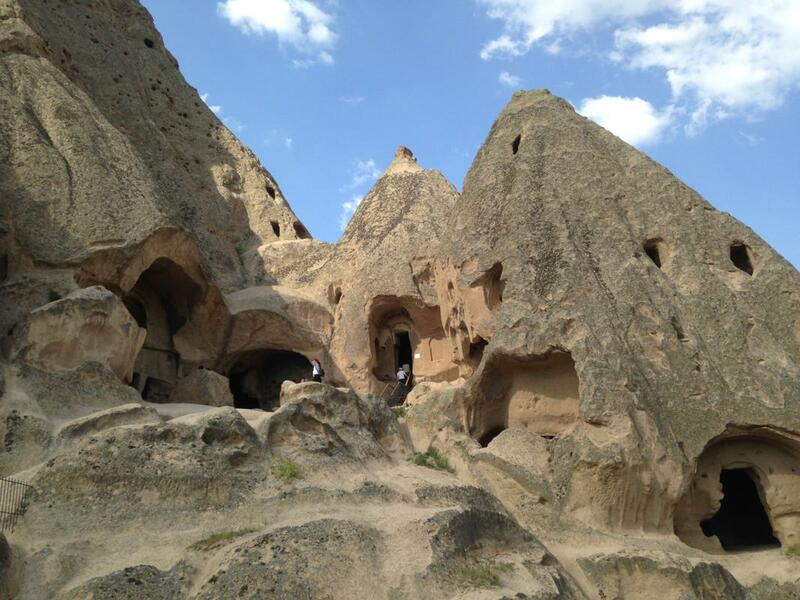 Weather: Summers in Cappadocia are bone dry and hot, with temperatures well into the 90s. Winters are cold and snowy. The best weather is April/May and September/October. Language: Most people in contact with tourists know some English, but it would be helpful to learn some basic Turkish words. Other Christian Sights in Turkey: Former churches of note in Istanbul include the Hagia Sophia, a Byzantine wonder that was once the largest church in Christendom, and Church of the Holy Savior in Chora, with its dazzling Byzantine frescoes and mosaics. The Apostle Paul tread the streets of Ephesus, a remarkably well-preserved Roman archeological site not far from the Aegean coast; the nearby House of the Virgin Mary, where the Virgin Mary is said to have spent her last days, draws throngs of pilgrims. Many itineraries follow in the footsteps of St. Paul, who carried the message of Christ throughout Anatolia; sites visited include locations of the Seven Churches of Revelation. In the town of Demre in Antalya province, the Church of St. Nicholas is a place of pilgrimage named for the 4th century saint who started the legend of Santa Claus. By the Book: Insight Guides’ lavishly illustrated Turkey (455 pp., $24.99, insightguides.com) provides background material on Turkish history and culture as well as practical tips on visiting Cappadocia and other parts of the country. Packed with nitty-gritty details is Rough Guides’ Turkey (724 pp., $27.99, roughguides.com). Information: Turkish Ministry of Culture and Tourism, hometurkey.com/en.